The Ballygarvan Club was there on the historic day that twenty-one clubs affiliated to the newly formed Gaelic Athletic Association; club delegates attended the inaugural meeting of the County Board in December 1886, and a club senior fifteen were beaten by Tower Street in the first, contested Cork County Hurling final in 1888. With a tradition like that, small wonder that the club is vibrant to this day. But Ballygarvan's story was not all about success and the struggle to survive has been hard and unrewarding, if the measure is merely championship success. I spoke this week to club chairman Edmond Forrest, in the news recently when he made a very good showing in the contest for the County Board Vice Chairmanship, reaching the seventh and final count. Edmond was honorary secretary for three years '76-79 and honorary treasurer in '83 and has been chairman '80-81 and since '86. In those years from '79, he has been South East Board honorary secretary for three years and chairman from '83 to '85. Just in his early thirties, he represents well the young GAA officials round the county who are getting things done for their clubs and divisions with quite efficiency. Undoubtedly, the big day in the life of the club was the opening of Páirc Liam MacCarthaigh on Easter Sunday 1984, Centenary Year. Interestingly, this was the site of the old Feis Field and, when the club purchased an adjoining 5.8 acres last year, it was found, with some research, that this was known as the 'trysting field of old'. The club now has a complex which would be the envy of senior grade clubs and, the courage of those who purchased and built, must feel justified when young boys and girls (there's camogie too) enjoy the magnificent playing facilities, serving the needs of the people of the greater Fivemilebridge-Farmers Cross area. There is a full-sized championship pitch and clubhouse building which includes four dressing rooms, built to a flexible plan. Partitions may be removed to open up the entire internal area as the need arises and the need could be the weekly card drives or step dancing classes. A step back to those early days shows that the Barrs had their first recorded game against Ballygarvan at Belvedere and, even before the formation of the GAA, hurling had been played in the whole south-east area of Crosshaven, Carrigaline, Tracton, Shanbally, Ballymartle and Ballinhassig. The first county championship was awarded to Cork Nationals (Blackrock) in 1887 and then the following year Ballygarvan were caught in the final by Tower Street, the forerunners of Redmonds. Heartbreak too in 1896 when Ballyhea beat Ballygarvan in another final. It must be remembered that these were times of social upheaval with the Parnell issue occupying minds in 1890 and the Invasion of America, as the flight from Ireland was known, having taken place in the 1880's. There was a fine revival in the club in the twenties when founder chairman Dan Carroll and honorary secretary Simon Bowen got things moving and there is a documented AGM for 1928. A year later the great runners-up would be caught again at the final hurdle by Tracton in the South East junior final. In the twenties a teenager emerged who would bring fame to his club and his adopted Waterford and would return to be a significant influence in Ballygarvan. Eamonn Carroll, son of founder Dan, went to Teacher Training College at de la Salle Waterford and would wear that county's jersey with distinction. He would play at centerfield with the Decies against Cork in '31 at Clonmel. He played opposite the great Jim Hurley. The first game was a thrilling draw but Cork won the replay easily. That year, any GAA man will tell you, Cork went on to beat Kilkenny in the historic three match All Ireland final. Eamonn, on his return to Cork, played with the Glen to win four county final medals in a row, being a sub in '37. Eamonn became chairman of Ballygarvan in '38 when a teacher at the Model School in Cork City. He was then appointed principal of Farren National School. Eamonn played wonderful golf to win the All Ireland Seniors Championship a few years ago and was renowned in his younger days as a bowl player. Eamonn had captained that beaten Ballygarvan fifteen in '29 and vice captain was Jack Spillane. A brother Dan Spillane is a survivor of that side. There were dark days too in the forties and the club joined up with Ballinhassig to become Owenabue Rovers, as Shamrocks and Kinsale had once done. In '46 the Chairman, Vice Chairman and Honorary Secretary were all named, Jim O'Sullivan, which must have caused some confusion. In '49 Christy Sheehan led a gallant fifteen who would go down to Valley Rovers in a South East final. Con Murphy figured on the Valley side. Despite the defeat the revival brought about by Joe Bowen and John Twomey had the right effect. No honours then until Toss O'Leary led a fine League winning '67 side. In '74 a single point seperated Ballygarvan from Shamrocks in a B championship semi-final and Edmond Forrest is convinced that if Ballygarvan had gone out, the club would have folded altogether. Ballygarvan beat Ballymartle in the final. That Ballygarvan side was led by David O'Sullivan. 1977 was a great year for the club with the winning of the 'A' championship by a team led by Billy Dillon and the purchase of the club grounds. The then chairman Tim O'Callaghan spearheaded a massive development drive, which established Ballygarvan as one of the most progressive in the county. Edmond pays full praise to Justin McCarthy who coached the Ballygarvan men and the club is still benefiting from his expertise. 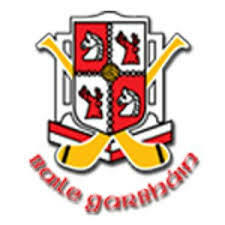 There was camogie played in the club in the twenties and the club won the O'Higgins Cup in '34. Eamonn Carroll's sisters, Maud and Rose, were among the top players in the club then. The game is coming on well again with the work of Norah Brady, Eileen Kidney, Gay Foster, Ann Walsh and Kathleen Ashman. Most encouraging aspect for the hurling club is the attraction into the club of over one hundred under-age players who attend the Saturday skills programme. Helping out in this vital area are: John Kearney, Ed. Cotter, Billy Dillon, Denis Keohane, Liam O'Donovan, John Forrest, Michael O'Brien, Bernie O'Sullivan, and Kieran Cremin, a local teacher, as the club are now involved in the school's shield competition. Vice Chairman of the club is Finbarr Marshall; Hon Sec. Bernadette Murphy; Treasurer Denis Keohane; Registrar Michael Twomey and PRO Edmund Cotter. It would appear that the honours will come Ballygarvan's way and they have the stamina to wait for that deserved success. A famous son, Liam MacCarthy would be very proud of his beloved Ballygarvan. Ballygarvan Clubman of the Year ('77), now President, Donal Twomey when he received a presentation from the then Chairman Tim O'Callaghan.